Life Solutions Network – We inspire people to live, work and serve to their purpose, passion and potential. 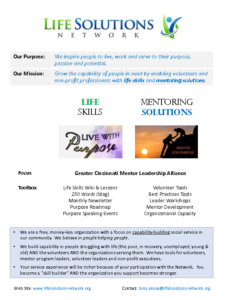 The Life Solutions Network is a volunteer-driven network for volunteer mentors and social service professionals who choose to serve our community by building the capability of people in need. Volunteers choose the organizations they support; the Network then supports them with tools, ideas, personal mentoring and other resources. Capability-building takes many forms, e.g. mentoring, financial and job coaching, life skills instruction, problem solving and much more. We serve in our passion and grow personally as we serve. Most of the people we serve are struggling with some aspect of life, e.g. poverty, financial distress, unemployment, illness. Grow the capability of people in need by enabling volunteers and non-profit professionals with life skills and mentoring solutions. We love volunteer development; we want you to serve to your purpose and potential and be the best volunteer (or professional) you can be, wherever you choose to serve. A free, open-source life skills “wiki” is available for personal learning or in serving others. It is module-based and can be adapted to fit specific needs…informally or as a curriculum. It is unique in the way skills are defined and learning paths presented with content such as one-point lessons. We bring together volunteers and non-profit professionals to create content and tools. I am only one person but I know I must and can make a difference. I imagine countless volunteers, civic leaders and people in ministry energized and serving to their unique purpose and potential – working together to make our community a thriving place to live by building capability of those who are struggling. I believe in ‘people helping people’ – deeply and sustainably. You can find LSN on-line in various ways. Each outlet has a similar intent, i.e. to present information, ideas and tools to grow personally and better serve others. Life Skills Wiki. This is targeted toward volunteer mentors but this can be used by many. Volunteer Solutions. 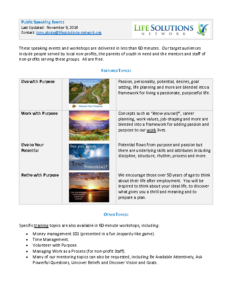 Resources for new and experienced volunteers and volunteer leaders. Mentoring Solutions. Resources for mentors and mentor program leaders. Links to external recommended resources such as books, bloggers and web sites. Blog. Our blog is about life, life skills, volunteering and living to our purpose and potential. The blogs are short (250 words) and easy to read. Live with Purpose (on Facebook). Live to your purpose, passion and potential. Work with Purpose (on LinkedIn). Work and lead to your purpose, passion and potential. Note: links in green font on this site require registration and appropriate access level. Newsletter. A newsletter keeps you informed about the network and life skills. Note: if you already receive the newsletter, you must still register on this site for access to Friend-level content. 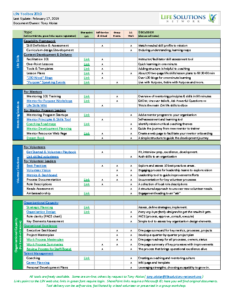 Lesson plans and wiki templates in Microsoft Office formats (doc, xls) for editing. Volunteer Solutions toolbox, especially for Volunteer Coordinators. Mentor Solutions toolbox, especially for Mentor Program Leaders. Personal support with life skills curriculum, volunteer processes or general business planning. Greater Cincinnati Mentor Leadership Alliance. LSN sponsors the newly formed “alliance” of local mentoring organizations. We are collaborating to raise the overall capability of our mentoring efforts. 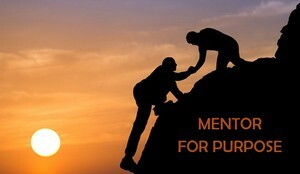 Mentor for Purpose Workshops. We have beginner and advanced workshops for volunteer mentors. Click here for access to the Mentoring Principles and Skills Assessment Tool. Volunteer Mentoring. Contact us if you are personally exploring volunteer mentor opportunities. We are particularly interested in supporting new volunteers who want to serve the community by sustainable, capability building.